Now that the news is out about munchie-reducing cannabis, more “diet” cannabis strains are on dispensary shelves. Innovations in cannabis research lead to innovations in cultivation. Once news broke that high-CBD strains can be used for serious conditions like epilepsy, a variety of CBD-dominant plants showed up on dispensary shelves. The latest trend? Cannabis that halts the munchies. Here’s why growers are rushing to develop “diet” cannabis. The news made mainstream headlines last year. Certain compounds in the cannabis plant may reduce appetite and treat diabetes. The cannabinoid taking the limelight is tetrahydrocannabivarin (THCV). The molecule is thought to have about 25% of the psychoactivity found in THC. However, the compound can also speed up your overall high and make it come on quicker. Animal research has found that THCV reduces body weight and improves glucose intolerance. Early human trials of the cannabinoid show that it effectively reduces blood glucose level, increases fasting insulin, lowers blood pressure, and reduces inflammatory markers. These successes have lead British pharmaceutical company GW Pharmaceuticals to experiment with various cannabis-based diabetes drugs. There’s one strain that’s becoming more common on dispensary shelves these days. 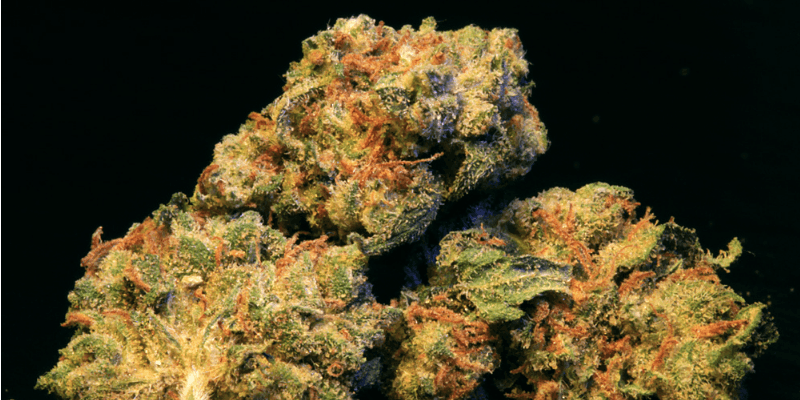 A sativa-dominant hybrid, XJ-13 is thought to be one of the best choices for those hoping to suppress appetite thus far. Most popular on the West Coast, breeders like Cascadia Gardens, Noble Farms, Willie’s Reserve, and Northwest Kind all have recently started producing and selling this cannabis strain. Like all cannabinoids, the amount of THCV in any given bud depends on its growing conditions. While the strain itself is capable of producing higher levels of THCV, not all flower samples will show high concentrations. Therefore, it’s best to ask your dispensary for testing results if possible. In a recent King5 News Segment, Cascadia Garden’s version of the herb was highlighted for its munchie-free experience. Thus far, there are no strains that are THCV dominant. But, there are some strains that come close. In a test by Steep Hill Labs, kief from the Doug’s Varin produced a whopping 15% THCV. That’s the highest we’ve come across thus far. Knowing that certain strains like XJ-13 and Doug’s Varin are high producers of this cannabinoid, breeders can create crosses from these strains that hopefully produce higher and higher amounts of THCV. The weight loss and glucose modulation effects of THCV may also be intensified by CBD. In the GW Pharmaceutical trials mentioned above, the company treated 65 diabetic patients with a drug that contained both THCV and CBD in specific ratios. Their study also highlighted research which suggested that combining both cannabinoids reduced fat buildup in the liver, a dangerous marker of metabolic syndrome. Back in 2013, CBD made headlines as the new “it” cannabinoid growers were rushing to cultivate. Now, there’s a new rising star. Perhaps sometime soon some lucky breeder will stabilize a strain that is both high in CBD and high in THCV, much like the pharmaceuticals that are in the experimental phase. For now, breeders are toying with strains which have already shown pleasant, favorable results. Have you tried XJ-13 or Doug’s Varin? Share with us on Facebook, Twitter, or in the comments below. We’d love to hear from you?